I know some of you out-of-state readers are experiencing the same unusual weather conditions that we have been getting in Nebraska this spring. Earlier this week it hit record highs of 95° and then this past weekend, it barely got over 45° with wind that just wouldn't quit! As I sit here typing this on Sunday morning, I have the space heater running at my feet and days ago I was contemplating turning on the air conditioner. Crazy stuff! My friends, John and Tammy Musil, (yes, another John & Tammy), held their annual poker ride yesterday. So even though the temperatures were less than ideal for this fourteen mile ride, they put a lot of time into it and if you have ever tasted John's BBQ that he prepares for the after party, it is worth riding in less the perfect weather just for that reason alone! Ginger and Windy were literally shaking as we saddled them up. (Did I mention the wind?) I went to the trailer and found my long underwear and slipped them on under my breeches and reluctantly zipped up my winter coat. Gloves and an earband under the helmet took away some of the chill. We were ready to ride. And really, once we got moving, it wasn't too bad. 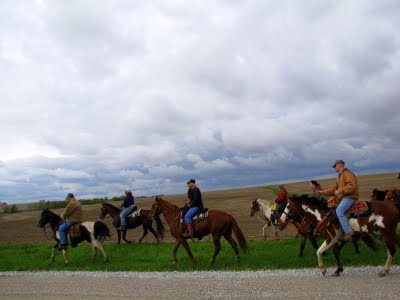 There were plenty of times we were riding next to treelines that provided some sort of windbreak and other times down at the bottom of the hills where you didn't feel the wind. Really, I would rather ride in weather like we rode in yesterday than sticky hot humidity. Due to the mines in the area, the roads around the Weeping Water area are limestone. Although you can ride in the ditches, sometimes that is scary with the litter or broken bottles. Last year my horses did it barefoot and were fine. Windy is shod right now, so I wasn't worried about her, but Ginger was just trimmed a couple days ago. As I was contemplating this ride, I had the farrier make sure Ginger's feet were contoured well enough to fit into a pair of EZ Boot gloves. If you recall, I bought them last year for our Wyoming trip and lost one the first day when we ended up in a bog. I figured one boot did me no good at all, so had bought a replacement but had never used them again. 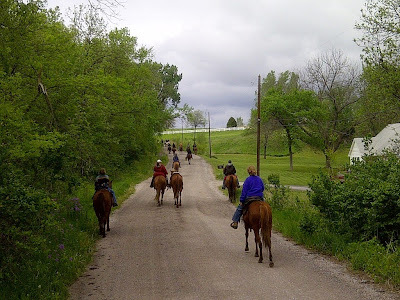 John was somewhat reluctant to use them at all – he hates anything that might be a hassle when riding, but I am happy to report that they slipped on her easily and up until the final lope in the 13th mile, we had no problems at all with the boots. We headed out about noon. There were about 25 riders; many whom I knew and some who I didn't. 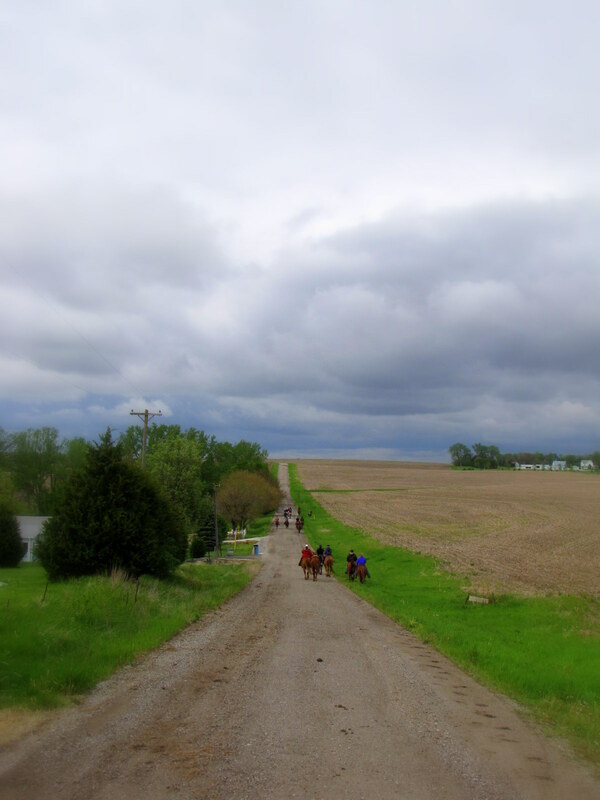 A route took us to 5 different stops where we would collect a poker card, the first stop being a farm a few miles to the south of the Musil's home. From there we continued on to the Farmhouse Lounge, a little candle shop/bar that is kind of out in the middle of nowhere. I am told they do skydiving nearby and this place is frequented by the jumpers. In this wind, there was no sign of jumpers today. After a short break there, we rode on to downtown Weeping Water. Population about 1,100 – it is a small town by most measures. Twenty-five horses certainly seemed like a parade riding through their main streets. We stopped at the local bar, picked up another poker card and then headed back out of town – to the north. The wind was blowing from the north so we moved right into it. After a stop at a mailbox along the way for yet another poker card, we rode into the beer gardens at a bar in Manley for the last card. By now we had been on the ride almost five hours. With the wind not letting up, most everyone was anxious to get back, unsaddled and eat BBQ. John, Robyn and I picked up the pace, alternating between long trotting and loping those last three miles. This is where the EZ Boot gloves failed. Once John moved Ginger into a lope, those boots came off. I noticed it; he whoa'd her and took them off the last mile of the ride. 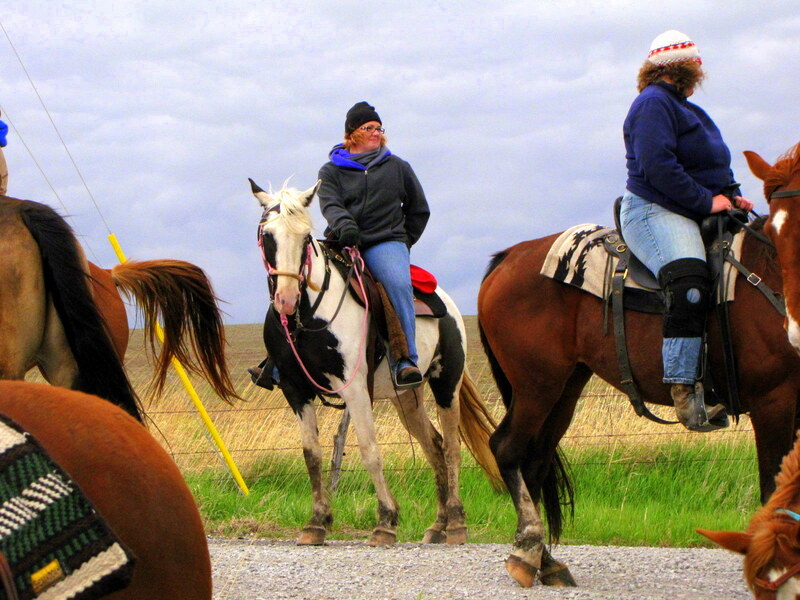 The horses grazed in a temporary corral while we enjoyed a hot meal. No regrets from any rider; we made the best of it. Next weekend I am riding a Competitive Trail Ride south of Kansas City. I am hoping the weather will be a little less of what we had yesterday but not as much as we had earlier in the week. Perhaps "spring weather" would be nice. I'm with you I'd rather ride in cooler weather minus the wind of course. Seems like a fun ride anyway and the BBQ at the end makes it all worth the trip. Too bad about the boots. Have a great ride next week! Ugh, wind is so challenging to ride in. Good job pushing through it! It might snow here today. We haven't had crazy heat, just alternating periods of perfectly nice spring weather and cold late winter weather. Yeah, I'll do just about anything for a good meal. Glad it didn't rain on you! That wind can take the fun out of a ride, glad you found some wind breaks. Sounds like a fun ride with a good size group. I always look forward to those kinds of rides. Crazy weather is right!! Looks cold on your ride, but sounds like fun anyways! The BBQ sounds so good!! And a good way to warm up! The overcast skies allowed you to take some AWESOME pictures! Love the clouds! Long johns?! You are a better woman than me. I probably wouldn't have went! I'm a fair weather girl. Can't stand riding in wind or cold! I like that bay Paint in one of the pictures. Looks like one of my old horses Spirit.